Our girls are our very own loved house pets, they are our 'children', and we strive to provide the very best care. To this end, we breed our girls only twice usually in their lifetime. **We never place adults, these girls are our own pets, and when their career in conformation showing and raising puppy families is complete, they continue their careers as our family companions. Of course our girls love to model and we take tons of photos of them. The girls wanted their own to show off all their photos, so here they are, in our online albums! 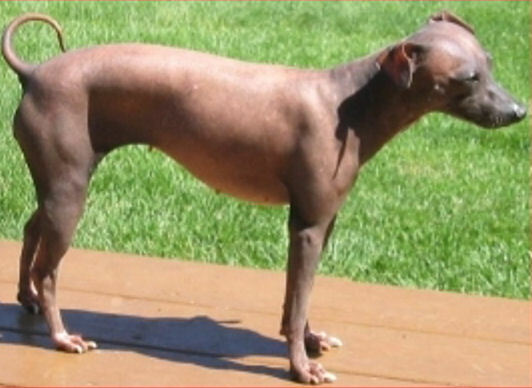 Check out hundreds of our American Hairless Terrier pictures on our Valley AHTs Imageevent and ValleyAHTs Flickr sites! Our very own Pinkee doing one of her favorite activities, basking in the sun! Don't let her calm look fool you though, if she spots a bird she'll be gone after it before you can blink! This site is © Copyright Valley American Hairless Terriers 1999-2007, All Rights Reserved.